Checkers is played on the same board as Chess, consisting of the same 64 dark and light squares in alternation on a square board. The most obvious difference between the two games is the differing nature of the pieces and their position at the start of the game. All of the Checker pieces are placed on black squares and all of their moves are of the same type, diagonally forward, until one of the Checker pieces gets crowned as King, then he has the ability to move and capture differently, forwards or backwards. There are several different varieties of Checkers, with differing rules of play. It so easy for played and has simple equipment. 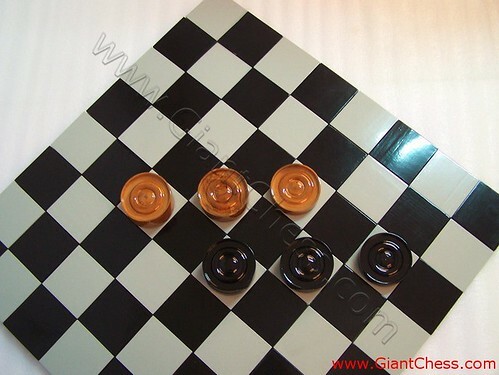 As showed in the picture above, you just need checker pieces and squares board for your game. To make it unique and worthly, we provide a wooden checker set. Those checker equipment are made of Teak wood and durable for outdoor use.